If you are looking to purchase the perfect diamond studs and give them as a gift to that special someone, consider a fabulous pair of diamond stud earrings. Diamonds have long been considered one of the best gifts to give someone and stud earrings are a classic piece of jewelry. Over the years, they have become a great gift for both males and females. When it comes to diamond stud earrings, there are many great choices. You can find earrings to suit every taste and style. Diamond studs are an attractive gift - one that is sure to get any lady noticed. Classy and elegant, diamond studs earrings are the perfect gift for any occasion. Before you head off to your local jeweler to buy a pair for the lady in your life, consider the following tips for finding attractive white gold diamond studs for a great price. What is the shape of her face? If her face is thin, then a round cut diamond studs will look best. If her face is broader in appearance, then princess cut diamond studs will complement her look. You'll want to match up the right diamond for the right face to give her the right look. What is her skin tone? The metal setting for the diamond should match her skin tone. White gold or platinum sets off a cool skin tone while yellow gold looks great on a woman with a warm skin tone. Don't settle for a cheap setting either - no diamond should be mounted on anything but a quality background. Did you find the right setting? The snugger the diamond is against the ear, the better. Crown-style settings push the diamond too far out and away from the ear, lending a gangly appearance, while three- and four-prong martini or basket settings look elegant and refined. When it comes time to shop for diamond studs, visiting your local jeweler is one choice to help you find a pair that she likes. However, the internet is also a place many men like to shop as nothing beats the convenience or value of shopping online. Key jewelers, including James Allen, have a strong online presence and offer a wide selection of jewelry choices at competitive prices. Low overhead costs mean that the savings are passed on to you. In some cases you will find that the savings can allow you to step up to the next level and purchase earrings with a greater carat weight. The advantage of using a jewelry site like James Allen makes perfect sense: you save money and you get more for the money. 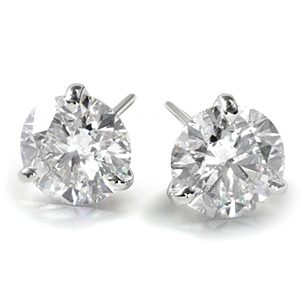 Besides, you can even create her pair of diamond studs right online! No matter whether you shop James Allen or another retailer, diamond studs are a special gift, one that complements her beauty and something that she will certainly cherish for many years to come. A favorite gift to give for most any special occasion are diamond studs, earrings which look great and can be worn around the house or while attending a wedding or dinner party. Elegant, refined, and stylish, most women already own a pair of diamond studs but a second or third pair is always welcome. Thanks to the internet, you can shop for diamond studs online and save a tremendous amount of money for the same quality diamonds sold by your mall's jeweler. Please read on for some tips on how to safely shop and save money on your next pair of diamond studs. Previewing diamond studs - One concern online shoppers have about diamond shopping is previewing the product before making a purchase. Clearly, you cannot hold the studs in your hand but an online merchant such as James Allen has 3D images of all of their products. Click on any image and the diamond studs will rotate giving you the same view you would see if you were at your local jewelry store. Buying your studs - Some online merchants are experienced jewelers, having gained practice working with customers face to face while others are resellers who are simply trying to capitalize on the marketplace. You'll want to deal directly with a professional jeweler who knows diamonds, stocks his own inventory, and offers generous insurance, shipping and return policies. Never purchase jewelry from an unsecured site and be careful when purchasing your diamonds overseas as you may not be able to enjoy the consumer protection you do here.